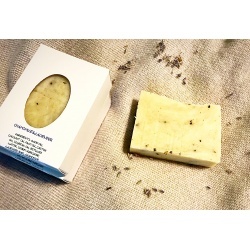 My homemade natural herbal soap bars are scented with Chamomile and Lavender Essential oil blend Chamomile is widely known for its anti-anxiety properties and other health benefits. It soothes irritated skin, calming down inflammation and sensitive areas. 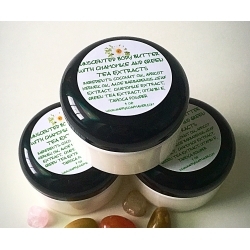 Also, I add Chamomile powder which provides extra moisturizing qualities for dry and thirsty skin, helps tighten pores, and has a light scent, making it perfect for most skin types especially sensitive, dry and mature skin. Lavender is a gentle remedy that helps to treat skin problems such as inflammation, irritation, acne, eczema, psoriasis, and sunburn. It soothes, calms, heals and regenerates Our formula is carefully chosen to be the perfect balance of ingredients that make our creamy lather, leaving your skin silky soft. - Olive oil is good for skin cell regeneration. Has not undergone any processing other than washing, decanting, and filtering. High in oleic acid. Good for skin cell regeneration - Coconut oil is rich in lauric acid. - Palm oil is the largest natural source of tocotrienol, part of the Vitamin E family - Castor Oil is rich in fatty acids. Acts as a humectant in soaps. - Soybean oil helps to hydrate and protects skin cells, replenishes the lipid barrier to help hold in the skins intrinsic moisture while softening dry, chaffed and damaged skin This listing is for one bar of about 4.3-4.7k oz each. Each bar of soap is individually packaged and labeled in a craft soap box. 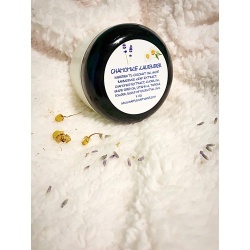 Chamomile Lavender Whipped all Natural Body Butter Moisturizer with Chamomile and Aloe extract is created with the best ingredients to give you the best quality for your skin. This Body Butter is enriched with Chamomile extract which possesses many powerful skin properties such as anti-inflammatory, anti-fungal, antibacterial, antiseptic, excellent healing abilities to minor skin wounds, process by disinfection. Natural skin lightener, promotes a healthy glow of the skin as it heals and restores its natural moisture content, soothes and heals burns. This Body Moisturizer contains Jojoba Oil and Grape Seed Oil. Jojoba oil is an odorless, golden liquid wax that is produced from the seeds of the jojoba plant. Jojoba oil is very similar to sebum – the natural oil that lubricates your skin. Jojoba contains nutrients like vitamin E and B, as well as minerals like chromium, copper, and zinc, which all nourish and protect skin from environmental stressors. Grape Seed Oil is reach in vitamin E and omega-6 fatty acid content. Aloe Vera extract moisturizes the skin. It enhances the appearance of dry or damaged skin by reducing flaking and restoring suppleness. This extract removes wrinkles and gives skin a healthier and younger look. It is an ample source of Vitamin E which is a nutrient to assist in providing healthy skin. It reduces the skin damage which is caused by continuous scratching. Sun burns can also be treated by using skin care product made of pure Aloe Vera extract. It can also be used for treating acne problems, dryness of the skin and many other types of skin problems. Coconut oil is rich in many proteins. These proteins keep skin healthy and rejuvenated, both internally and externally. Proteins also contribute to cellular health and tissue repair, along with a wide range of other essential activities within the body. Coconut oil is a great skin softener and helps you do away with dry and hard skin conditions. Has a high moisture retaining capacity so it acts as an excellent moisturizer for your skin. Contains mostly fats, so it acts as an emollient providing a softening and soothing effect. It contains medium chain fatty acids which are absorbed into the skin, where they can be directly utilized for nutrition and energy. This provides all the energy your skin needs to heal and maintain itself. Absolutely NO HARSH CHEMICALS - No petroleum - No Parabens - No preservatives. How to use: It’s best to rub in a light layer of the body butter just after a hot shower while the pores of your skin are still open. It may feel a little greasy just after application, but within minutes it will soak into your skin. The result is soft and glowing skin (not greasy!). Remember that body butter is thick and luscious. A little bit goes a long way! This Lavender Gift Set includes 4 oz Soap, 4 oz Body Butter and Bath Bomb. You will save 20% buying these products together. If you want a personal message me to include in this Gift box - please write me about it in comments. Gift set comes in a cute craft box and will be sent by USPS priority mail. 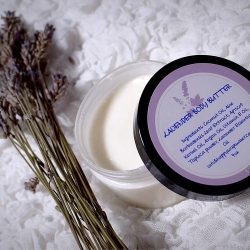 Lavender Whipped Body Butter is deliciously, creamy natural moisturizer. Butter is highly concentrated with the finest ingredients, nature has to offer. This unscented all natural whipped after sun body butter, with Chamomile and Green Tea extracts, will nourish and condition your skin leaving it silky-smooth. This butter melts into your skin on contact, softening, deeply hydrating and protecting even the most sensitive skin types. This Body Butter is enriched with Chamomile extract which possesses many powerful skin properties such as anti-inflammatory, anti-fungal, antibacterial, antiseptic, excellent healing abilities to minor skin wounds, process by disinfection. Natural skin lightener, promotes a healthy glow of the skin as it heals and restores its natural moisture content, soothes and heals burns. Also it contains Green Tea extract which is naturally rich in antioxidants, which has a cell-protecting function as well. It’s a strong antioxidant effect that protects the skin from the damaging effect of free radicals. Green tea extract also contains the Methylxanthines that stimulates skin microcirculation and therefore positively influence the tone and health of the skin. Aloe Vera extract moisturizes the skin. It enhances the appearance of dry or damaged skin by reducing flaking and restoring suppleness. This extract removes wrinkles and gives skin a healthier and younger look. It is an ample source of Vitamin E which is a nutrient to assist in providing healthy skin. It reduces the skin damage which is caused by continuous scratching. Sun burns can also be treated by using skin care product made of pure Aloe Vera extract. It can also be used for treating acne problems, dryness of the skin and many other types of skin problems. Coconut oil is rich in many proteins. These proteins keep skin healthy and rejuvenated, both internally and externally. Proteins also contribute to cellular health and tissue repair, along with a wide range of other essential activities within the body. Coconut oil is a great skin softener and helps you do away with dry and hard skin conditions. Has a high moisture retaining capacity so it acts as an excellent moisturizer for your skin. Contains mostly fats, so it acts as an emollient providing a softening and soothing effect. It contains medium chain fatty acids which are absorbed into the skin, where they can be directly utilized for nutrition and energy. This provides all the energy your skin needs to heal and maintain itself. Apricot Kernel Oil is rich in essential fatty acids like oleic and linoleic acid, apricot kernel oil is high in vitamin A. Vitamins A & C are good for mature, dry or sensitive skin. The apricot kernel oil helps skin retain elasticity, clarity, and suppleness. This listing is for one 4 oz all natural Whipped Body Butter.